Bidriware is a metal handicraft that originated in Bidar, Karnataka, in the 14th century, during the rule of the Bahamani Sultans. The term 'Bidriware' originates from the township of Bidar, which is still the chief centre for the manufacture of this unique metalware. 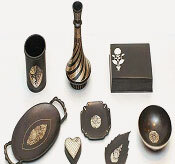 Due to its strikingly intricate inlay work involving pure silver, Bidriware has always been prized as a symbol of wealth. The metal used is a blackened alloy of zinc and copper inlaid with thin sheets of pure silver. Traditional Bidri artefacts are in high demand in the country as well globally. Bidar city is well known for its unique Bidri handicraft products. While Bidar in Karnataka and Hyderabad in Andhra Pradesh are the most vibrant centers, this art is also practiced in few other parts of the country like Purnia in Bihar, Lucknow in Uttar Pradesh and Murshidabad in West Bengal. The designs are mostly conventional ranging from creepers, flowers and sometimes human figures. The carvings are intricate and specialized in making idols of Gods and Goddesses particularly of Lord Buddha. Most of these items are marketed through Kaveri emporiums of Karnataka and Lepakshi of Andhra Pradesh. The Idols of Lord Buddha are exported to Taiwan, Japan and other Buddhist countries. Bidriware has some 500 years history, which also traces back to the period of the Nizams. Currently, the materials used by the artisans are silver, copper and zinc. The metals are sourced from Hyderabad, remaining requirements are sourced from local markets in Bidar However, the most important ingredient of Bidri articles remains the soil from the bottom of ancient buildings inside the Bidar Fort. This soil, which has not been exposed to rain or sunlight for centuries, has chemicals that give a lustrous black colour to Bidriware. And since it is hand made after long hours of skilled labour, it cannot be "mass produced" or manufactured in factories. Over the period of time Bidri work in India has regained recognition, the Government of India has put in place several new policies to boost the productivity and viability of this traditional handicraft industry.